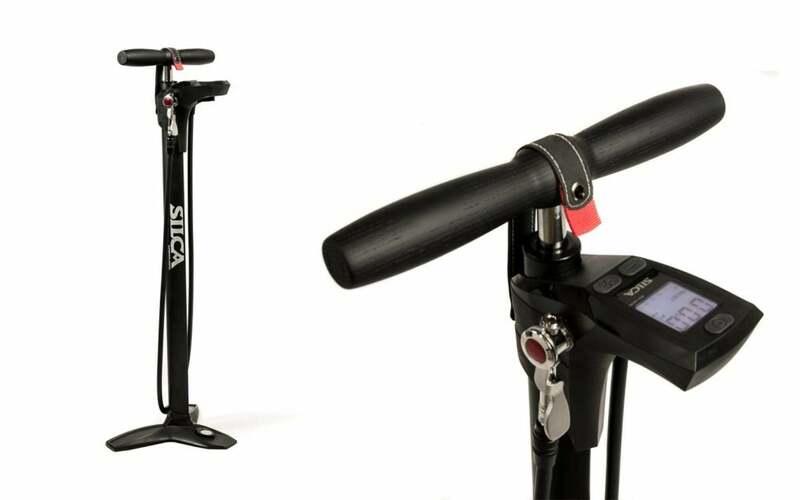 Silca Drops New Goodies A Digital Pump, a new/old Pista Plus, the Ypsilon Y-Wrench and a carbon bottle cage. When Silca drops new products, it’s always worthy of attention. 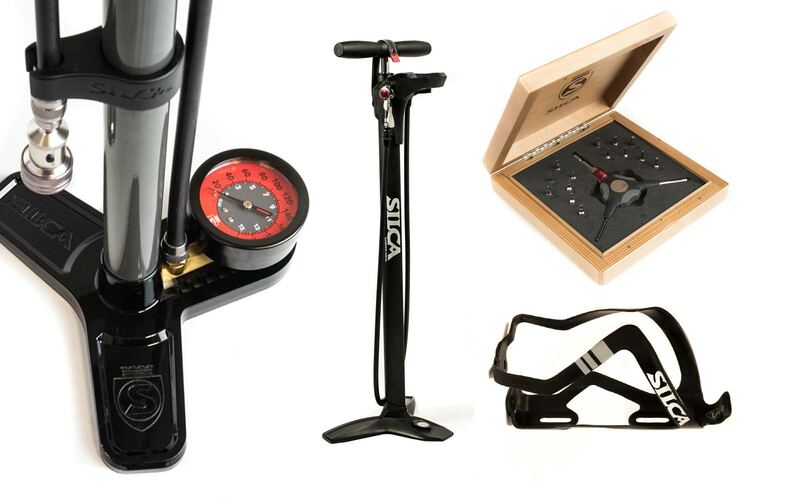 The launch of the SuperPista Ultimate redefined what a floor pump could be – and cost – while the products like the HX-One Home Essential kit and Maratona Gear Bag have been so popular Silca can barely keep them in stock. With these four new products – the SuperPista Digital, the Pista Plus, the Sicuro Carbon Bottle Cage and the Ypsilon Y-Wrench- Silca is continuing to fill out its offerings and may have just created the new must-have gift for the holiday shopping list. This new tool from Silca gets our vote as the must have accessory for the 2018 Holiday season. The Y-Wrench is a staple of any good tool kit, and most mechanics typically have at least three – two with hex keys and one with Torx heads. Like the most popular Y-wrenches, the Ypsilon has a 4mm and a 5mm head, but instead of a 6mm head it’s got a 1/4” bit collet, allowing you to put any 1/4” bit into it and customize as you wish. Of course, that usually means searching for the right bit at the bottom of your tool box right? Not with Silca. 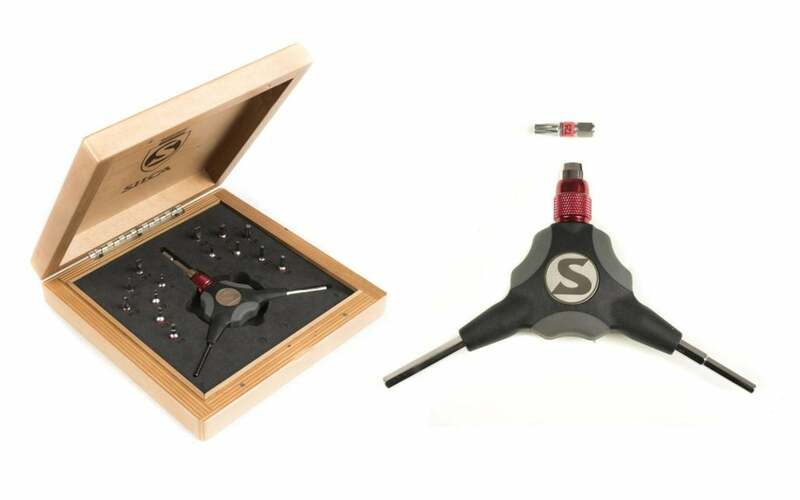 Like the HX-One kit, Silca has created a gorgeous box to store the Ypsilon as well as 15 different 1/4” bits. That’s the home kit, but you can also get it without the box, or just the Ypsilon itself if you already have an HX-One with all the bits. If buying the Ypsilon Y-Wrench for that special rider in your peloton, get the Home Kit. It’s beautiful. The floor pump is what made the original Silca famous, and it’s what has made this new iteration of the brand so successful. 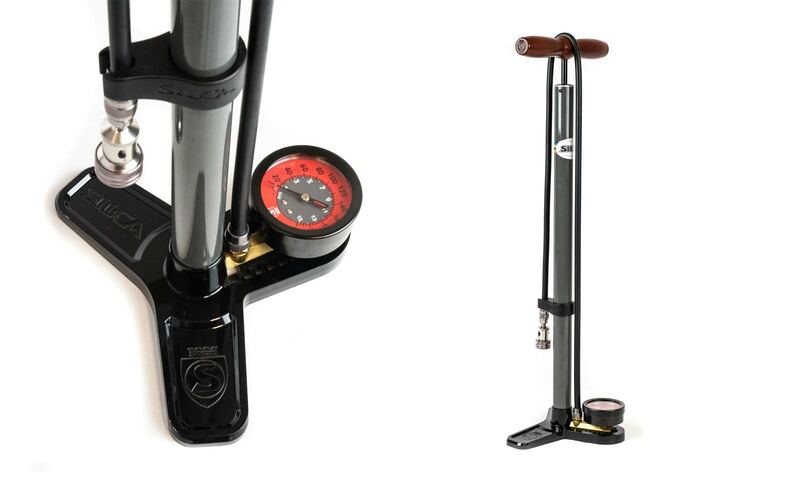 This new SuperPista Digital Floor Pump takes the SuperPista, with its suspension fork like design and tolerances, and adds a back lit, digital gauge accurate to +/-1%. It is also the first Silca pump to use a top mounted hose set up. The HIRO chuck, inspired by the legendary Hirame track pump head, sits in a magnetic dock. Rummaging through the original Silca archives from Italy, the brand found the design this new pump is based on. Pure Silca, it features a steel barrel, the famous Silca leather plunger, a 64mm gauge accurate to +/- 2%, and Silca’s beefy, push-on alloy Presta chuck. The ‘Plus’ part of the name comes from the wide, stable base and larger Ash handle making a great shop or home based pump. At $145 it’s a bit more than the original Pista, but like everything Silca makes, it’s designed for a lifetime of use. Carbon? From Silca? Of course! It was Josh Poertner who reimagined what Silca could be today, and he spent many years at Zipp, revolutionizing the carbon wheel game. This humble cage started with a study of what actually causes a bottle to eject using high speed cameras and a shake rig. Silca found out that just clamping down on the bottle harder was not a solution, it could actually result in holding the bottle in the optimal place for ejection after a washboard surface, not to mention the fact that it makes bottles harder to insert and wears them out. 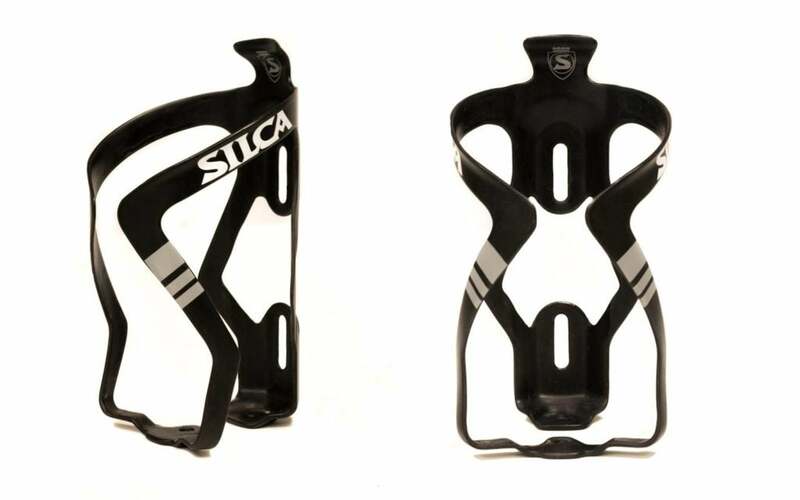 Silca created the Sicuro to hold with less force, yet the same vibration that ‘walks’ a bottle out of other cages, actually ‘walks’ a bottle back down, securely into the Sicuro. A little layer of visco-elastic polymer in the lay up – the same stuff many carbon endurance frames use -reduces vibration as well. The cage allows for 16mm of fore aft adjustment, and has Ti mounting bolts designed to spread the load more evenly to prevent damage to the cage.